TDP spent the weekend at the Hoop Group’s Pittsburgh Jamfest where we saw some great 17u (class of 2013) action…..
Kevin Johnson – No Ohio prospect improved his recruiting stock more over the weekend then the 6’2 point guard from OBC. Johnson dominated the game defensively like no other perimeter player that TDP saw while showing off elite level athleticism. Offensively he pushed the ball in transition and attacked while making smart decisions, shot the ball well, and played with good pace. Able to break his man down off the dribble whenever he wants Johnson intrigued several high major coaches with his play and will be followed around closely next weekend in Indianapolis. Devin Williams – The 6’8 OBC power forward competed, and competed, and competed over the weekend. Williams might have forced some plays offensively but his ability to rebound the basketball and score over physically inferior players could very easily translate to the college level as he improves his explosiveness. Williams was the most watched high major prospect and Ohio prospect in the event by far and away. Satchel Pierce – Much improved big man scored around the rim and really rebounded the ball nicely. The 6’11 Akron native made a huge difference in OBC’s run to the championship game as a shotblocker and finisher in the paint. Pierce has a wide frame and can eat up space while getting up and down the court with increased speed. Edmond “Junior” Early – The Shining Star combo guard has improved as a shooter and now has a complete offensive game. A hounding defender who is a nonstop aggressor with the ball in his hands Early was consistently able to blow by his man and score from all three levels for his team. 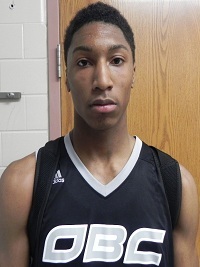 With his improved jumper, intense defensive style, and maturing demeanor Early will have a chance to earn some division one interest as April progresses. Monty Boykins – When he’s attacking the rim Boykins is a special offensive talent. He had some moments where he settled for tough jumpers but over the weekend he was one of the event’s top scorers as he was able to break his man down with a head of steam in transition to create a shot. The 6’4 Boykins runs with the Ohio Phenoms. Deontae Cole – Knocking down over 20 three-point shots in only five games is going to get a 6’6 combo forward like the Ohio Phenoms’ Cole some college looks. With great balance, footwork, arc, and a high release on his jumper he’s at least a proven specialist, and TDP thinks he’s an underrated all around player. Maverick Morgan – The 6’10 center from Martin Wolverines played with great physicality against DC Assault, impressing several high major coaches in the process. Playing with increased toughness around the rim Morgan was particularly efficient on the defensive end where he altered a lot of shots. Evan Bradds – Didn’t get to see enough of Bradds this weekend but he was excellent in what he did do. The 6’7 combo forward from Team Work really showed off his athleticism by scoring the ball around the rim. Anthony Dallier – 6’6 SF/PF Northfield (WV): OBC prospect can really stretch the floor as a long jump shooter who can handle the ball. Dallier attracted some mid-major interest in Pittsburgh. Major Canday – 6’2 PG Kiski Prep (PA): Pure point man in the Rajon Rondo mold can really pass the ball. Canday should be recruited at the mid major level, and might receive some even higher interest. Jaylon Brown – 6’0 PG Fishers (IN): Freakishly athletic combo guard is a great scorer around the rim and showed improved handle and jumper. Could be a high major prospect. Cole Murray – 6’7 SF/PF Delphi (IN): Intriguing stretch forward with very good ballskills. A mid major prospect that can shoot it from deep. Evan Payne – The Akron native will be attending Brewster Academy next season. TDP will be evaluating Payne on the AAU circuit as he plays with Dorians Pride out of Michigan. Rasheed Brooks – The Lexington prospect will be playing with Dorians Pride during the AAU season before heading to St John’s Military (WI) for a year of prep school. Willie Moore – Playing just one tournament this AAU season, with the Queen City Prophets, Moore picked up new interest from Oregon and several other colleges. Moore is currently on an official visit to Virginia Tech and then plans to check out South Carolina.